"Zip it, Stan Lee!" He's back!! 20th Century Fox has officially revealed a teaser trailer for Deadpool 2, the sequel to Ryan Reynolds' R-rated comic book movie from 2016. 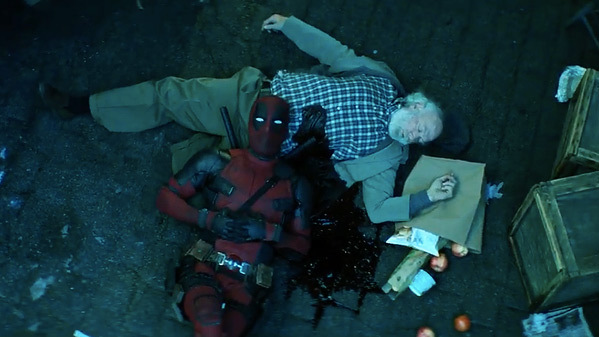 Reynolds returns to play Wade Wilson, the "Merc with a Mouth", though not much is known about the plot of this next one. This teaser was secretly attached to the beginning of Logan and can be seen in theaters this weekend. No one knew it was coming, and most of us didn't even know the sequel had started filming yet, but here we are. I love seeing surrpise teasers like this - it's exciting and encouraging, the studio is confident and fans will notice. The cast is said to include David Harbour as Cable, but nothing is confirmed. For now - kick back and enjoy this first teaser. One last thing! The new Deadpool piece is NOT a teaser or trailer. It is a short. None of its footage will appear in Deadpool 2. Deadpool 2 is the sequel to the smash hit Deadpool, based on the Marvel Comics character. Ryan Reynolds reprises the character he first played in X-Men Origins: Wolverine & Deadpool, a disfigured and mentally unstable mercenary known for his sarcastic, talkative nature and his tendency to break the fourth wall. Deadpool 2 is directed by filmmaker David Leitch, a stuntman making his second film after first directing Atomic Blonde with Charlize Theron (due in theaters later this year). The screenplay is written by Rhett Reese & Paul Wernick (who wrote the Golden Globe nominated first Deadpool movie, as well as Zombieland and G.I. Joe: Retaliation) with some additional script work by Drew Goddard. 20th Century Fox will release Deadpool 2 in theaters everywhere starting March 2nd, 2018 - one full year from now. First impression?